Dead Man’s Hand buildings are a growing range of side streets, main street and feature buildings, meant for Old West Cowboy towns and Mining CampTowns of the late C19th and early C20th. This building is ideal for the Main street or ‘Main Drag’ of town. Main Street buildings were very often brightly painted (at least below the eaves of the roof line) and this is no exception even the windows and door frames as well as the porch brackets have been painted to be bright and colourful. The external doors are all hinged and can open and close at any time. Not only is the outside highly detailed, the inside walls are well detailed and white washed. 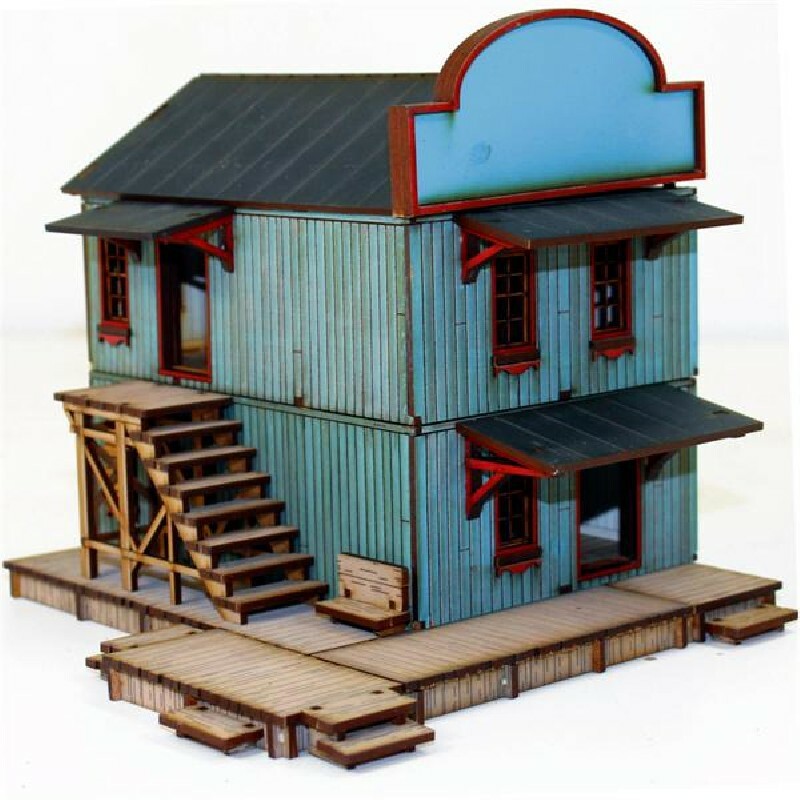 The ridged roof and porch roofs all come away to help with movement of figures during in-game action. The upper storey is accessed from the external staircase that sits on the boardwalk to the side of the building. The first storey sits securely on a raised sub-floor and also included with the kit are raised boardwalks that go beside the sub-floor giving many options of alignment. Often the main street was the oldest road in town along its boardwalks were the most established businesses (very desirable realestate well worth fighting over to control). Main Street buildings ‘lots’ were often developed from single storey buildings into multi storey ‘balloon framed’ structures, some with internal staircases but often with external stairs as each storey was occupied by a different resident or trader to the one above or below. Roof ridge and head boards may have been left dull and weathered other than name signs to advertise the occupants trade or profession but usually the lower storeys were brightly painted on all sides to better help them stand out and be remembered by passing customers. Multi storey ‘balloon framed’ buildings like this appeared all over midwest America during the 1870’s. These timber framed buildings often with massive head boards became common place in hundreds of towns with the advent of industrial saw mills, producing standard lengths of cheap timber and delivering that timber by train then wagon to the most remote of ‘one horse towns’. Some of those towns would fail leaving only their buildings as ghosts of the towns they once were, others would grow and prosper and in time all these buildings would be replaced or faced by brick and stone facades. Many very civil modern towns in the USA were once the domains of ‘big shots’ and ‘money men’ who lived and died for their ‘boardwalk empires’.